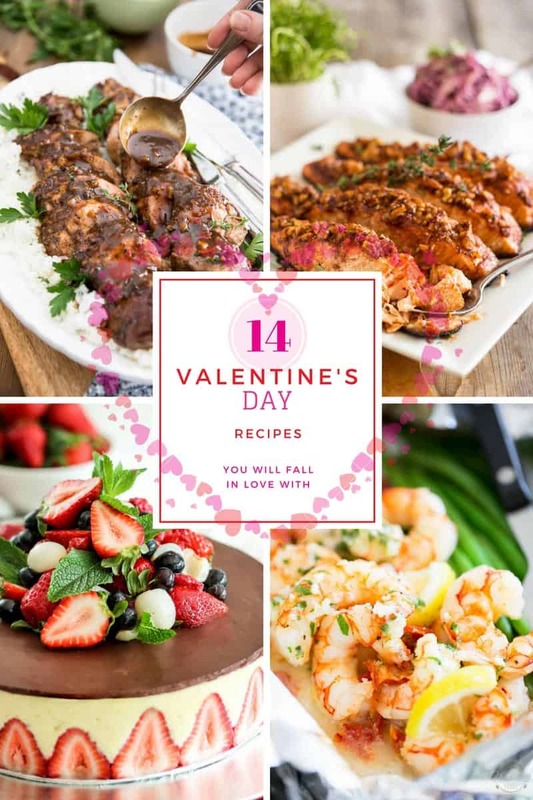 An assortment of 14 of my favorite healthy recipes to that will have you fall in love this Valentine’s Day… cuz who says healthy can’t be loveable! Can you smell this? No, I’m not talking about the food… I’m talking about LOOOOOVE! Yes sir! 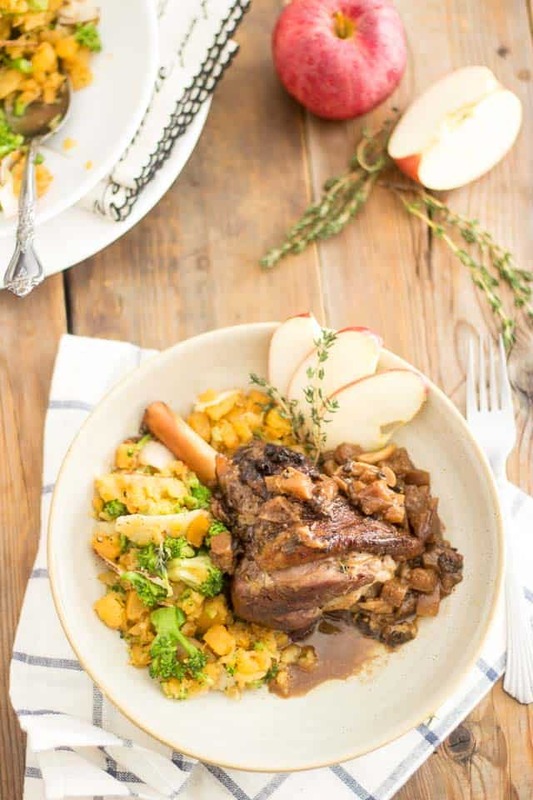 Cupid’s special day is just around the corner and I thought perhaps you’d be looking for a little bit of cooking inspiration in preparation for this romantic evening. Right, let’s not go there… let’s take a look at them dishes instead, shall we? 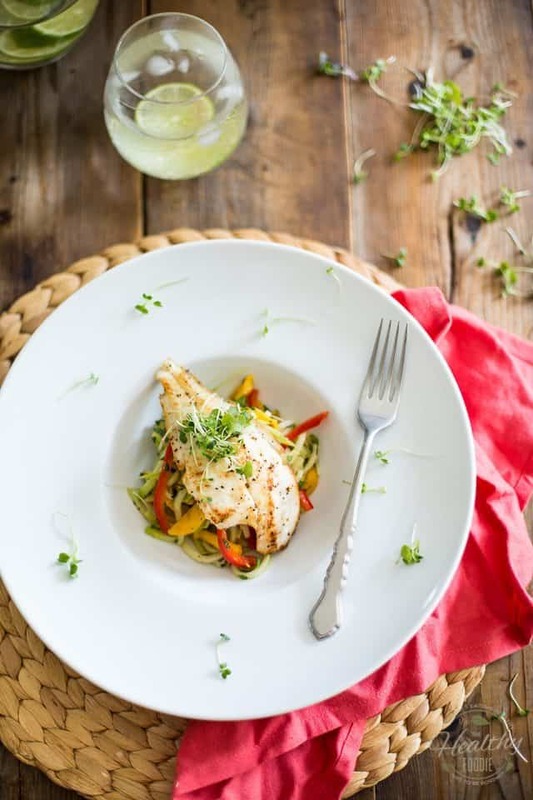 You’re looking at a lightly pan-seared fillet of Sole served over a light and super delicious Mango and Chayote Salad: this one would make for a great appetizer, one that is totally restaurant worthy but also incredibly easy to make. 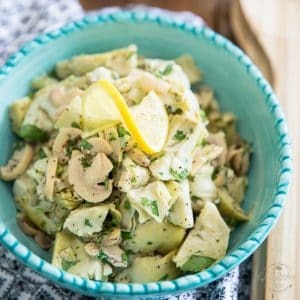 While the fish has to be cooked at the last minute, you could very well make the salad ahead of time, if you wanted to win some precious minutes and spend them with the love of your life. 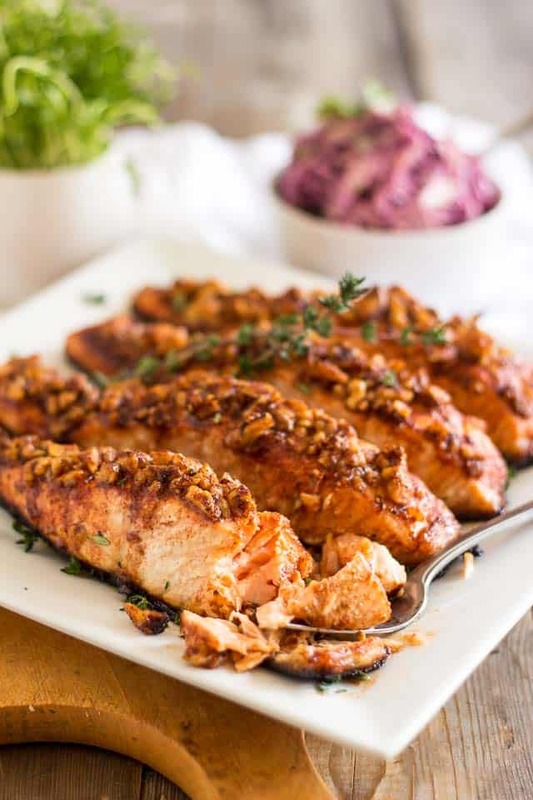 If tuna is more your thing, then this beautiful tuna steak that’s been quickly seared and marinated in a sweet and tangy pink grapefruit and ginger marinade is just for you! 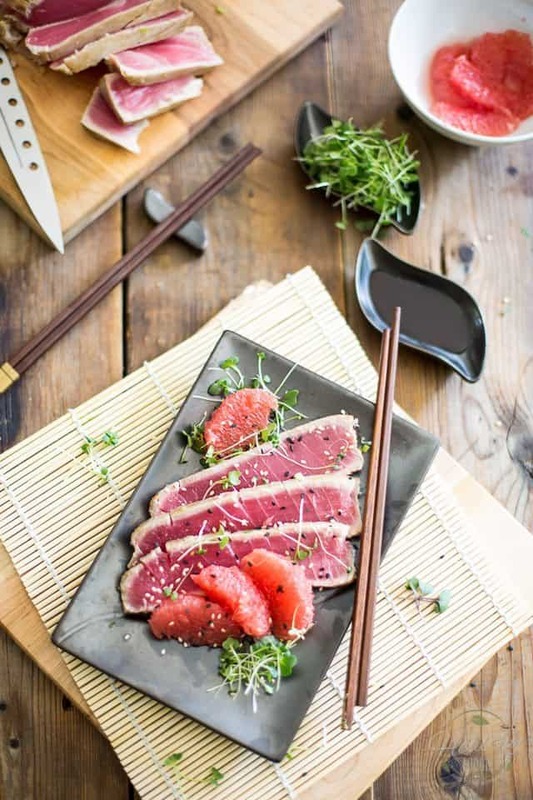 This Grapefruit and Ginger Tuna Tataki is simple, fresh and delicious, could very well be made ahead of time, and again, would make for a fantastic appetizer or be served as a light meal, with a side of white rice and a handful of fresh greens. 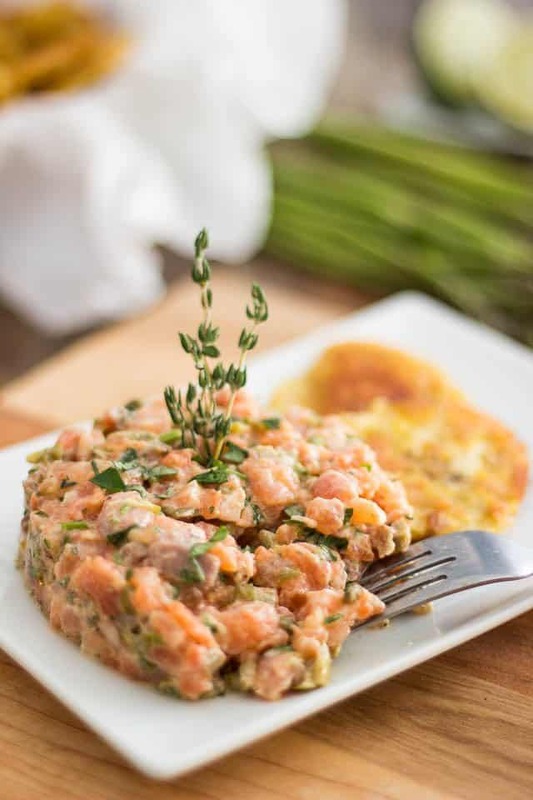 As good looking as it is delicious, this Two-Salmon Tartare uses both fresh and smoked salmon; it is so incredibly tasty, it’s bound to become your new ultimate favorite tartare recipe! 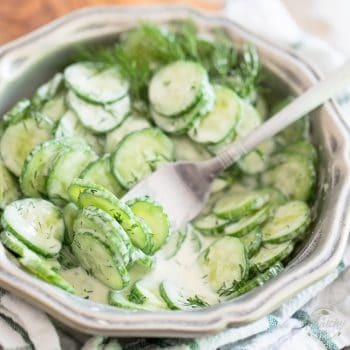 Can be made a few hours in advance and is absolutely perfect served as an appetizer or light meal, with a few crispy tostones or crackers. And the good thing is it can totally be made ahead of time so the two of you may get to spend more time together. 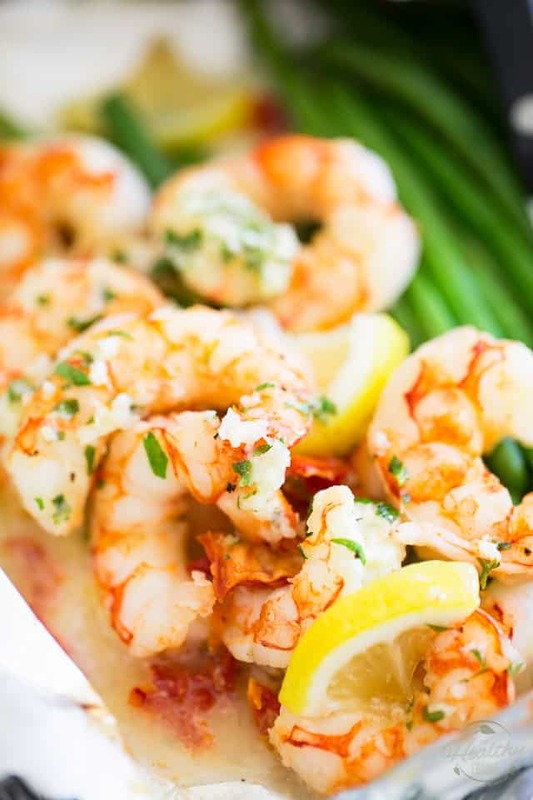 Goes fantastic with a glass of red wine, too… just sayin’, you know! 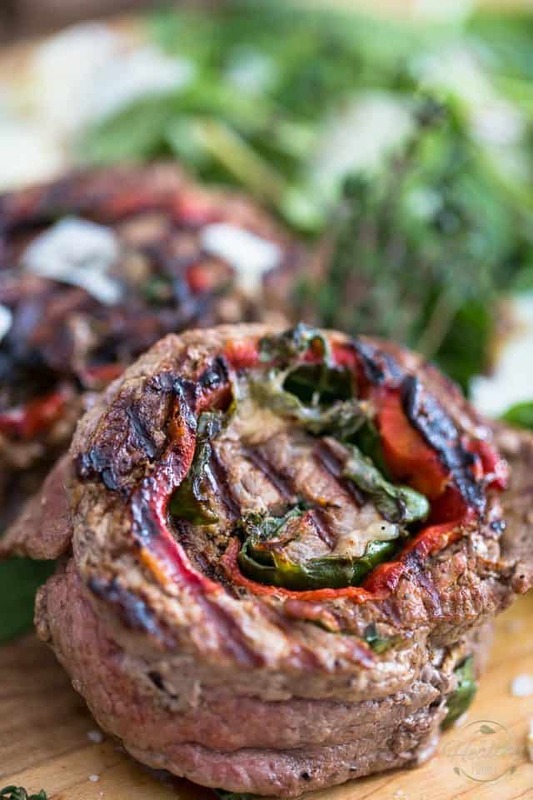 Turn the ordinary into extraordinary with these beautiful beef pinwheels, stuffed with Sweet Roasted Bell Peppers, Baby Spinach Leaves and Shaved Parmesan Cheese. 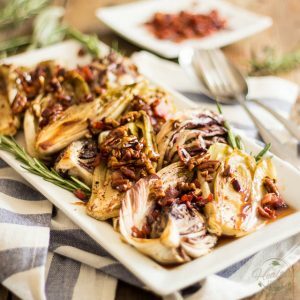 Here’s a dish that will require a little more time to prepare, but most of it is cooking time, so you won’t even need to attend to it. And once it’s ready, you can just keep it warm until you are ready to eat. Trust me, this one is in no hurry, it’ll wait for you very patiently. And honestly, the flavor combination of this dish is so astonishing, it tastes just like it has been created by an assemblage of angels. How appropriate, don’t you think? I’m sure Cupid would approve! I absolutely LOVE pork tenderloin. 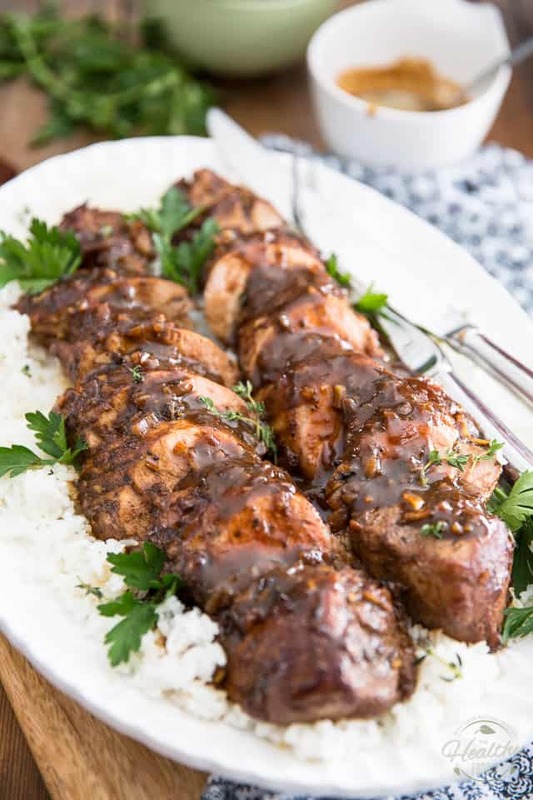 I guess it’s only natural that I wound up including my Maple Balsamic Pork Tenderloin recipe in this celebration of love roundup! 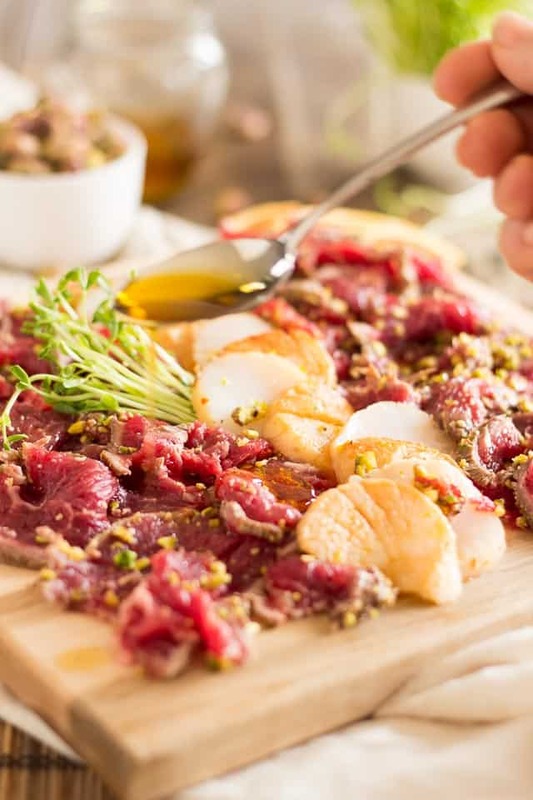 Not only is this cut of meat super lean, but it’s also unbelievably and naturally tasty, juicy and tender, so you don’t need to do much to it at all in order to turn it into a more than decent meal. Plus, it cooks in no time at all: bonus! 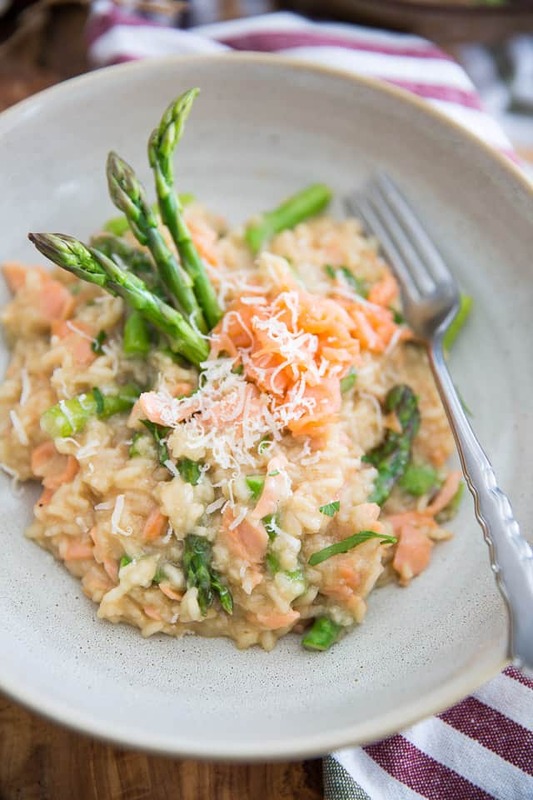 If you’re looking to make something that’s more on the “comforting” side, then you can’t go wrong with this Smoked Salmon Asparagus Risotto. I’m telling you, every single bite of this risotto will make you feel like you’ve been invited to heaven to share a meal with the gods! Okay, I think I need to work on that one. The joke, that is; NOT the dish. 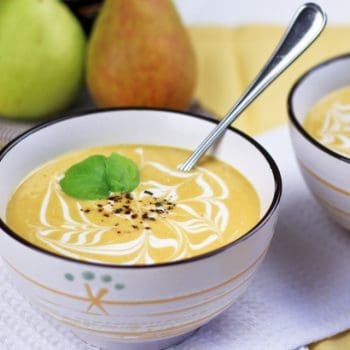 Cuz seriously, I mean it: this one is a true winner: Quick, easy and absolutely delicious. Score! 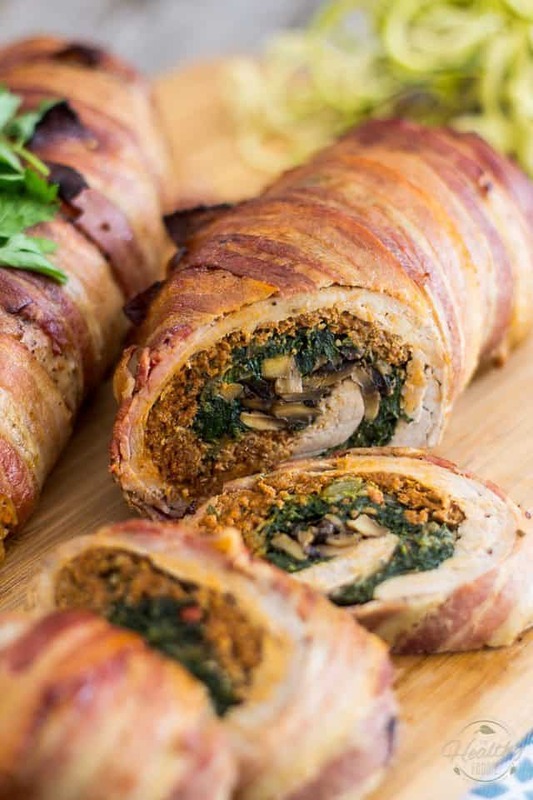 We’re talking juicy pork tenderloin stuffed with spicy Homemade Italian Sausage (although you don’t absolutely HAVE to make your own), spinach and mushrooms, all wrapped up in smokey, crispy bacon. Total pork heaven for any pork lover! No Valentine’s Day dinner would be complete without some kind of a chocolate dessert, now, would it? 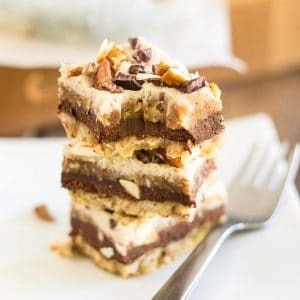 Well, here’s a quick and easy one for you, if you want to put a more-than-decent dessert on the table that won’t take more than a few minutes to make. 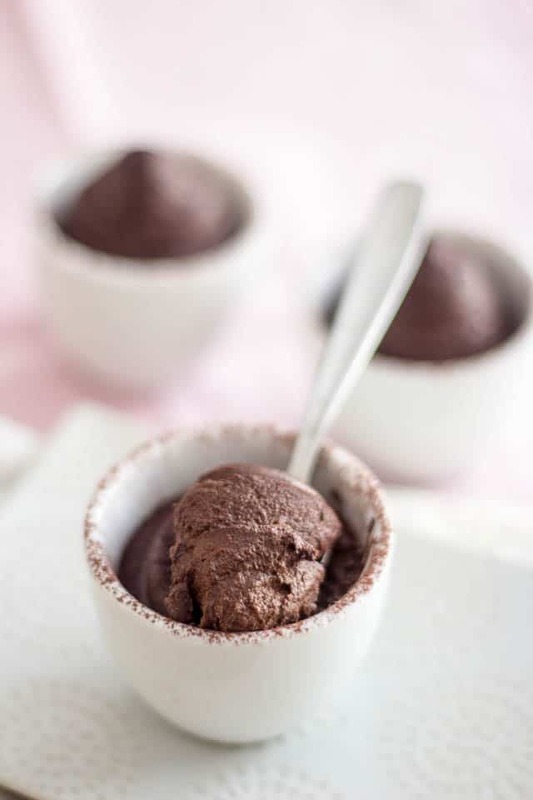 Plus, despite being entirely dairy free and refined sugar free, this Dark Chocolate Mousse is so insanely rich and delicious, you’ll probably end up making it all the time! 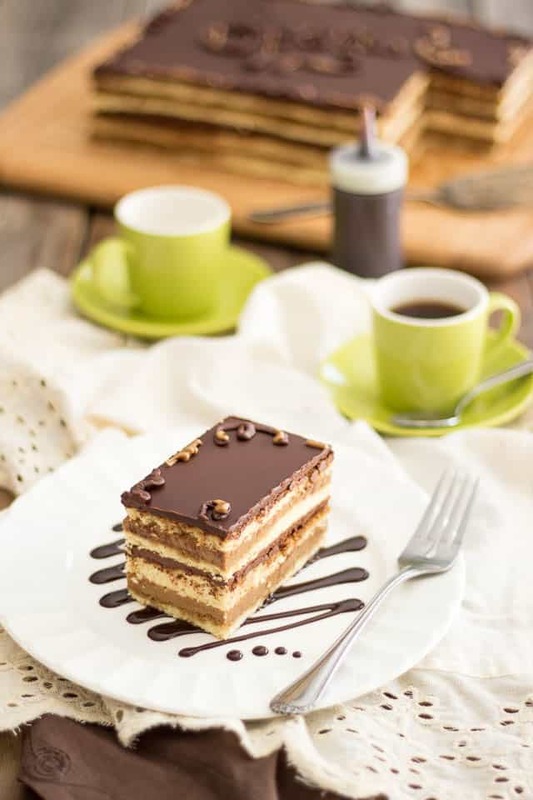 It seriously tastes just like the finest traditional Opera cakes of this world but contains no grains, no dairy and no refined sugar. Honestly, it’s so good, it’s worth every single calorie and every single second you’ll spend working on it. And hey, about them extra calories… I’m sure you can think of many ways to burn them off! This is one of my favorite creations ever! Hey, you gotta admit that it is a pretty spectacular cake, and I have no doubt that, if you choose to give it a go, all your hard work will be greatly rewarded. If you have your heart set on making that magnificent and scrumptious cake, you’re gonna have to get your hands on a copy of my book, because sadly, the recipe isn’t available on the blog. It’s entirely worth it, I swear. Plus, you’ll get access to so many other great recipes, too! 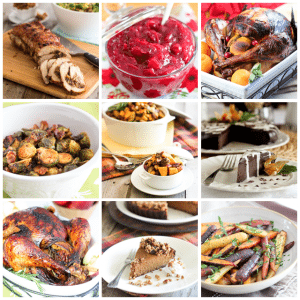 Indeed, I’ve got plenty other great recipes you would fall in love with in Paleo Home Cooking! In case I didn’t get you covered here! 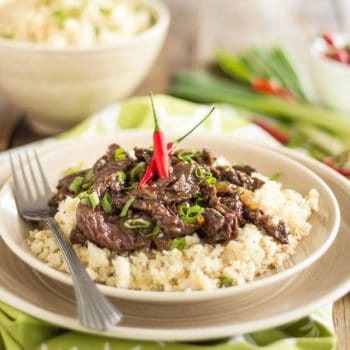 If you’ve tried these recipes, or any other recipe on the blog, please take a minute to rate the recipe and let me know how things went for you in the comments below. It’s always such a pleasure to hear from you! 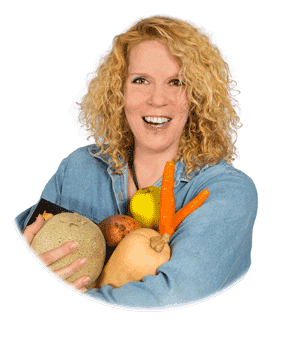 You can also FOLLOW ME on PINTEREST, FACEBOOK, INSTAGRAM and TWITTER for more delicious, healthy recipes! Wow is all I can say! I would have a hard time choosing what to make for my sweet man ( we’ve been married 17 years) but with these ideas, I can’t go wrong. The way to his heart is definitely through his stomach. You must be proud when you look at this sampling of your work. You’re just excellent, esp. those desserts. Picture perfect! Wishing you two the most beautiful Valentine’s day, filled with harmony, love and affection – and many many more to come, too! Sonia thank you very much for all these tips……….Sorry to say i haven,t use them on valentine but I am going to use every dish of this blog on my marriage anniversary that is on coming 25th February……And after that i will definitely conform you what’s result…………. 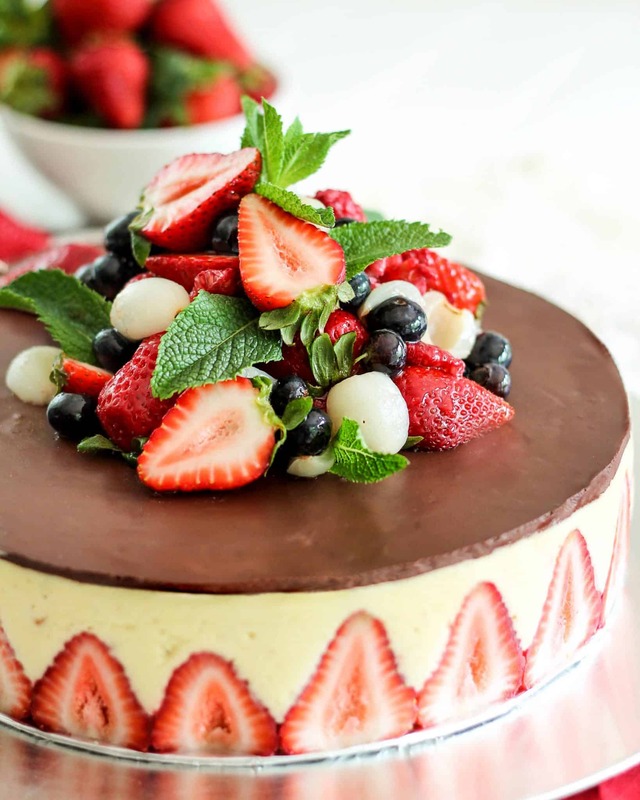 Awesome recipes for Valentines Day. Thank you, this helps a lot especially that Saint Valentine’s Day is fast approaching. 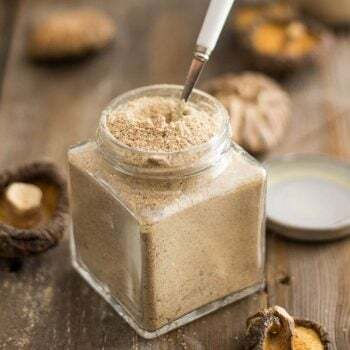 Magic Mushroom Powder – Umami In A Jar!